Oct 31, 2017 07:00 GMT: The UK’s Communications Providers have welcomed the ambition of Openreach, Britain’s digital network business, to build a large-scale Fibre-to-the-Premises (FTTP) network across the country. There is also broad agreement that FTTP would safeguard the UK’s position as a leading digital economy - but to make the investment viable, a number of key enablers will need to be put in place through close co-operation among the communications industry, Ofcom and Government. Openreach, which builds and maintains the millions of miles of wires and cables that connect Britain’s homes, businesses and devices to the internet, has been consulting its wholesale customers - Communications Providers such as Sky, TalkTalk, BT and Vodafone, and hundreds of others represented by the Federation of Communications Services. It wants to see if there’s enough demand for a large FTTP network that could deliver Gigabit speeds and more reliable broadband services for decades to come. The consultation, which was open to all CPs and ran from mid-July to the end of September, found that there is broad support for Openreach to build a large-scale FTTP network which would bring substantial benefits for all, including better, more predictable services and faster, more consistent broadband speeds. It also highlighted significant benefits for the British economy and society, such as productivity growth, opportunities for smart cities, and greater application of e-health and e-learning services. In the near term, most CPs expect Britain’s existing broadband technologies to provide enough speed for the majority of consumers but, whilst there is no consensus on when Gigabit speeds will be needed, they agree that ultimately a large-scale FTTP network will be a necessity. Given the timescales involved in building that network, there is strong support for Openreach to start the engineering work required sooner rather than later. 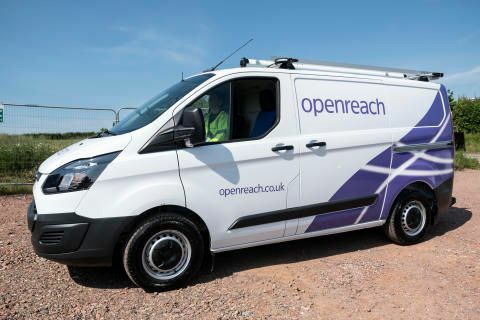 Openreach is working to demonstrate that its engineers can build FTTP connections at scale in urban and suburban areas for a competitive price. It has been trialing new deployment techniques across the country and drawing on the latest techniques and tools from around the world to bring the costs down. This activity has already resulted in a halving of the cost of its FTTP delivery over the last year. Like other network investors, Openreach is also seeking a more supportive policy and regulatory environment to build more FTTP in the UK, including a constructive resolution to the application of business rates and to Ofcom’s Wholesale Local Access (WLA) market review. The economic case will also rely on local and central government support to reduce red tape, for example by simplifying wayleavesi and traffic management processes. Openreach will need to recover the costs of a very large investment in a new, faster and more reliable network in the wholesale prices it charges to CPs. A large-scale FTTP network is likely to benefit a broad set of customers over time, so Openreach believes the costs should be spread fairly across a broad customer base to reflect that. This would help to keep down any wholesale price increases required to support the investment case, whilst CPs and Openreach would benefit from cost savings through the increased reliability of the network. CPs acknowledge that charging a large premium for ultrafast services alone is unlikely to succeed, but question how much more customers will be willing to pay for the same headline speeds on a better platform. Openreach estimates that building FTTP connections all the way to ten million front doors would cost in the region of £3bn to £6bn, so deciding how that investment can be recovered fairly through wholesale pricing will be critical to making a commercial case work. The consultation also uncovered broad support for a ‘switchover’ approach to FTTP which would migrate all customers onto the new platform – and retire the old one – as quickly as possible after it has been built in a given area. But it’s clear that the operational complexity and cost of such a programme would be significant. Both Openreach and its wholesale customers agree that protecting service continuity during a switchover - especially for vulnerable consumers - and communicating the process effectively would be critical elements of any programme. Having acknowledged that, there was agreement that migrating customers in this phased approach would maximise the benefits for all parties and help to strengthen the economic case for investment. Some CPs are also interested in sharing the risk of the investment, but in return for preferential terms on the infrastructure that’s built, with a variety of different models suggested. There were also a range of views expressed on how Openreach should decide on the scale, make-up and locations of the new network, and these will be considered in detail as the business develops its new network strategy. Clive Selley, CEO, Openreach, said: “We believe that under the right conditions, we could build FTTP connections to ten million homes and businesses by the mid-2020s. We want to do it, we think it’s the right thing to do for the UK, but it’s clear that we can’t do it alone, so I’m encouraged to hear that our wholesale customers support our vision. “Having said that, we’re under no illusions about the challenges that lie ahead because we need to build a business case that’s workable and fair for everyone. That means we need a regulatory environment that encourages investment, and we need to agree how the costs of such a huge engineering project can be recovered fairly from all those that stand to benefit. Openreach is now considering all of the responses and options carefully as it develops its new network strategy. The business will then invite views from CPs on a more specific set of proposals that cover potential pricing, footprint, and a plan for automatic switchover, by the end of 2017. It continues to welcome discussions with CPs on co-investment, risk-sharing and network architecture approaches, and will continue engaging with Ofcom and Government to build an environment that encourages and facilitates investment. i The consent in writing that allows Openreach to carry out work on privately-owned land.